I was born with a lifelong case of tunnel vision. Tunnel vision eliminates all the reasons not to do something. Tunnel vision eliminates the need to stay in a comfort zone and work towards a reachable goal. Guess another good thing that comes with a narrow focus is that it lessens doubt. Doubt is one of the big 3. That being: fear, worry, & doubt that only cloud the issues that have no bearing on the outcome. Besides, it's in our DNA to explore, see new places, do new things, accept new challenges, and always look over the next horizon. This pretty much describes my journey into the realm of video, because going in, ...like usual ...I didn't have a clue! 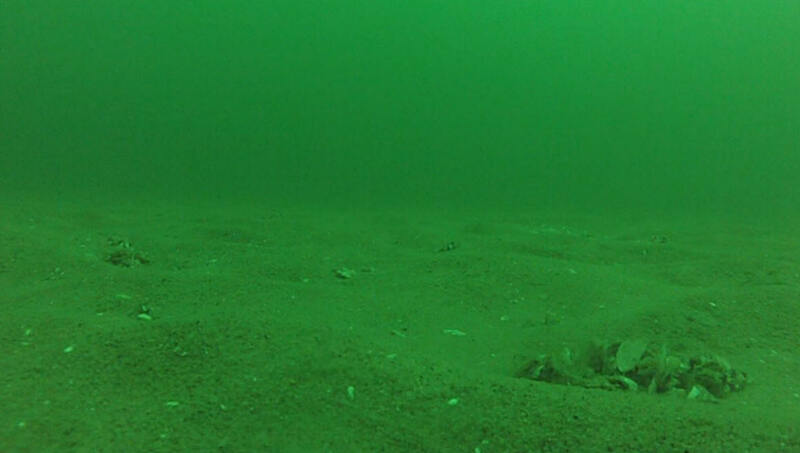 Got hooked on underwater videography the first time I stuck my eBay cheapie Extreme Cam in the drink in April of 2012. Seeing, yes ...actually seeing what was going on down below to me was a revelation. An awakening of the long held hidden dream of seeing the same way fish see things (fish-POV) might become a reel-reality! All underwater sport cameras we can afford were designed for shooting videos above water. Acton cams use regular lighting and do a phenomenal job in the battle of cost vs. quality. Forget the well-lit beautiful full-color video scenes we see normally. That just ain't gonna happen in the nutrient rich Great Lakes waters when you're shooting video footage at deeper depths. In truth, I'm a dumber than a stump newbie to video. Above and below water, but know what I want to see. 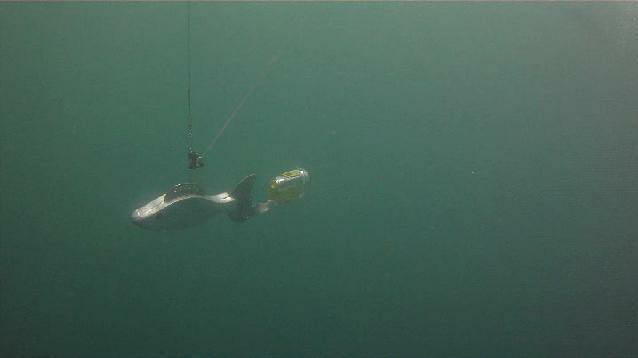 Only shot video at depths from 30' to 150' down twice late in the 2012 season. Touching on this has given me a long list of fun to-dos in the 2013 season. Reel-facts say there were a lot more video questions presented ...than answers. It will be my pleasure attempting these video-audio questions in the future! Technology is on a constant forced march towards the future. Advancements in video has led from bulky shoulder mounted camcorders to cameras that now fit in the palm of your hand. Cost is very reasonable. $200 to $250 will buy either a Go Pro Hero, or a Contour camcorder. Both cameras have their good points. Contour is fully water proof to 1 meter without a case. GoPro is not. Go Pros have a leg up with a replaceable battery, but are only waterproof inside their protective case. Audio value is superb in the Contour Roam. Even inside the waterproof housing, the Contour captured the surprisingly annoying rigger wire hum along the noise of my 15 hp kicker 4 stroke motor at depths of 100' to 150' down. Kickers (trolling motors) might be quiet on top, but downstairs? ...it's a piercing sound machine like a rattle trap junker car with a hole in the muffler riding on rims. Sport camcorders are made to capture events with no muss and no fuss, but this comes with a loss of features. The ability to zoom to better frame your subject matter will not happen with either a GoPro, or Contour. Field of view is extremely wide beginning at 170 degrees. Close-ups are very fisheyed with distortion from the center of the frame outwards. After about 5'-6' this skewed view becomes less noticeable. Going into the realm of the rarely seen appears to be a mystery that needs the detective skills of Sherlock Holmes to unlock. Sure, topside we get to catch fish. But what's going on down below? This is our unseen handicap. Piecing together what might work and what does work is strictly all trial and error. My overt fascination with underwater cameras stems from my quest for the magic bullet in color selections. Seeing things from a fisheye point of view might/could go a long ways solving the right color mystery. That being ...the amount of available light, as a full season runs it's course depending on water clarity. If you're like most of us, your time on the water is at a premium. Wasting time with colors that do not provide outstanding visibility is a reel-waste of time. While fish feed with other factors such as sound and scent, having a lure with a definable standout profile is where the reel-bonus comes in. 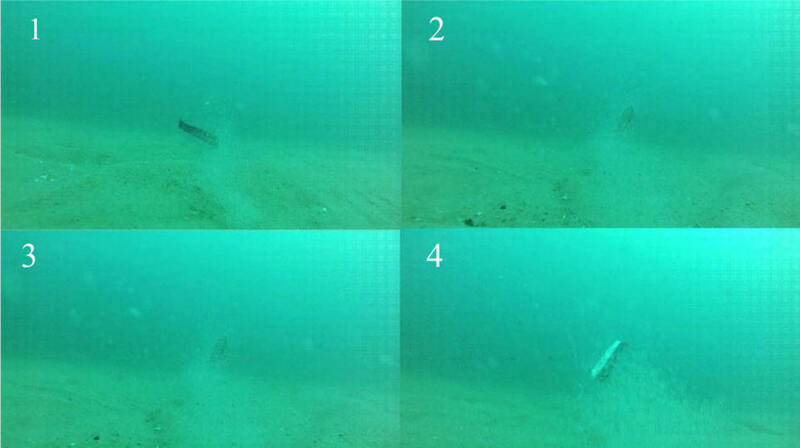 First couple of underwater test session's footage says the outline of black is the easiest for the camera to see. Keeping in mind, black would be the easiest color for the camera to capture. Meaning? ...what the camera sees best, but not necessarily apply to Mr. Fish. It would be some where's dead-wrong and plain stupid to apply camera vision to the highly evolved visual acuity all fish are born with. Something I long suspected is the dive rate of my line of 12" flashers. Underwater camera confirmed my 12 inchers will dive down below the trolled path of the cannonball. How much free depth is gained? From what I could see, it looks like around foot for ever 10' of lead length, drop-back, or distance from the ball. Hence, on a 30' lead off the cannonball, the flasher will dig 3' more. It stands to reason having the attractor and meat rig/fly down below the slipstream i.e. disturbed water has to be a major plus. Tighter closer to the ball, faster the action is a lesson I relearned after reviewing the video late season footage of my 12 inch flashers at depth. Proper trolling speed that gives a lazy action that still entices a fish to the dinner bell is like being between a rock and a hard place. Most of my fishing efforts tend to focus on the later morning to mid-day fish that present more of a challenge. Hungry, banzai dummy fish at first & last light? ...the need for precise speed control is not that critical. Just remember to control your trolling speed. Not your speed controlling you! Rigger hum and the racket of my 15 hp. 4 stroke kicker motor is intense at depths to 70'. There's far more underwater noise telegraphed down below than I could have imagined. Standard downrigger cable was used in my late (Sept-Oct) test sessions with the Contour underwater edition. Even inside of a heavy duty plastic housing ...the annoying hum-squeal of the cables was extremely noticeable. This is a bunch better explained by watching the above video that is a must see companion of this article to gain more understanding. Downrigger cables telegraph a huge volumes of noise. This fact was proven when I ran out too much rigger cable and the weight laid on the bottom momentarily ...then all went quiet. Under no tension, or slack in the cable, silence was achieved. Once the weight was pulled off the bottom the din of the obnoxious cable howl and the low drum-hum sound of the kicker was back in full force. While kicker motors are fairly quiet above water. Motor and prop harmonics are being transferred down ...into the water. So, cheese the idea Salmon and Trout are easily spooked creatures not interested in biting, or ready to shy off from any sounds not deemed natural to their environment. 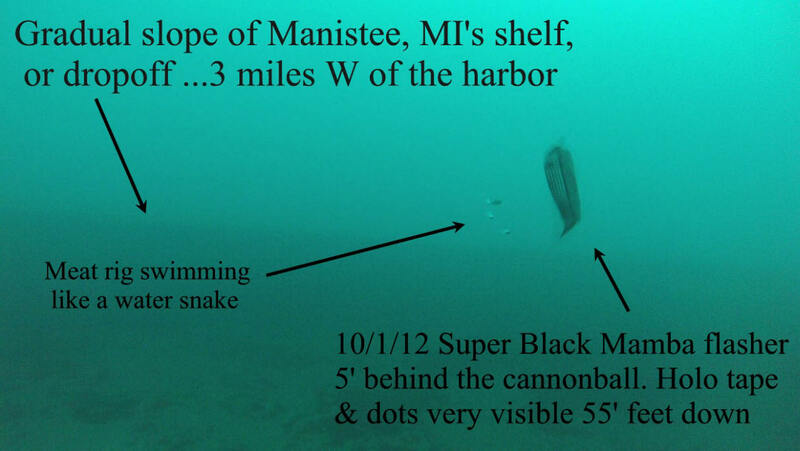 Far to the contrary, Great Lakes cold water species are willing to feed aggressively, at all times of the day. How else can you explain a King/Chinook Salmon going from a egg (about the size of a pea) to a full blown adult, possibly over 30 pounds if there's enough forage around ...to fuel a 5 to 6 pound a year growth rate? Please do not overestimate waterproof downrigger camcorders. These little marvels can fit in your palm were made to work above water. Where there's plenty of light. Full HD frame rates are 30 frames per second. This is a 5 frame increase over the standard 25 frames per second with the older style standard TV. So, there's just not enough time to provide more exposure duration the camera needs ....being limited to 1/30 of a second to make moving pictures/video footage in an environment that fades to black around 100'. Amount of light at depth is going to be highly dependent on the angle of the sun, plankton in the water, sediment or, turbidity caused from wave action. So, the amount of available light will be over a wide variance during the course of an entire season. Anything deeper than 80' to 100' all the Contour Roam saw was the black abyss between distant galaxies, minus any light whatsoever. Range on how far back submerged camcorders that offer up a halfway decent image is going to depend on the time of the season that has a lot to do with plankton growth. 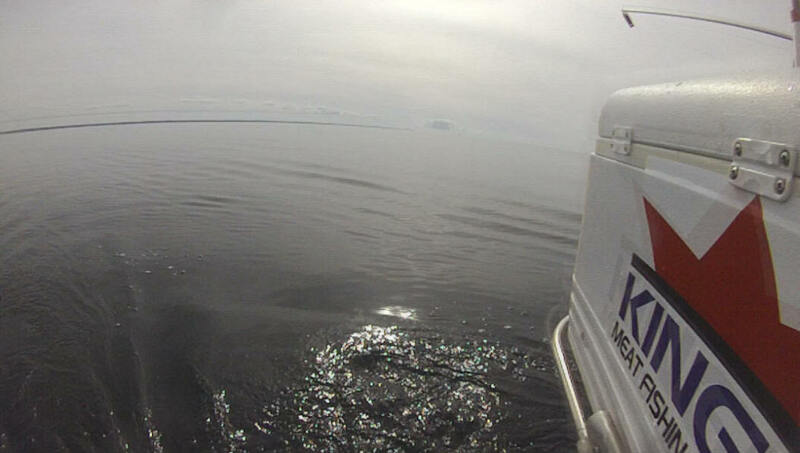 Warmer fall waters when my tests began loaded with plankton. This was driven by one warmest summer on record during 2012. Possibly, the warmest overall since record keeping began. My brief venture into the word of underwater video in 2012 only laid the ground work for further explorations in the future. In my mind, there's more questions then answers using a rigger cam only twice. I'm looking forward to the fun bringing you the best info on the web. My skills at post video production are on the rise. It's fun turning out reel movies! Videoed flashers on a sunny flat calm day around the end of September, then about week later on October 1, 2012 with clouds and light seas running at no more than a 1'. Surprising enough, the day I shot video when it was cloudy without a ripple on the water seemed to provide more light downstairs. Don't take this to the bank just yet, cuz with only 2 hours of filming at depth any firm rules written in stone is a long ways off. Did notice black flashers provided the best visible profile to the camcorder. Keep in mind, black is the darkest color for the camera lens to discern the fast exposure rate at, or less 1/30 of a second. 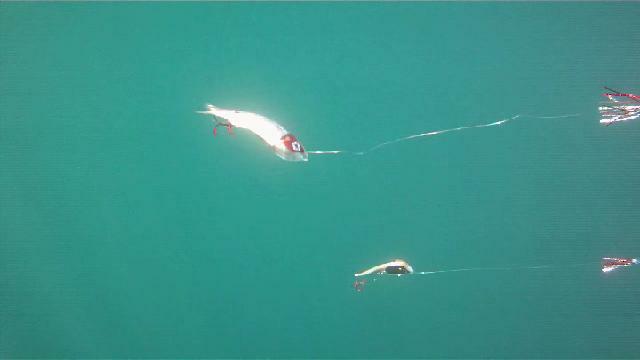 There's a steep learning curve filming above and below water due to the reel-fact the light is so vastly different. So, this article will be revised as time goes along. Let's never forget what we see, or the camera sees is not what a fish sees Why? ...evolution has fine-tuned fish vision with a very complex eye that is made to see underwater, cuz that's where they live. It's a major mistake for us to impose what we see on Mr. Fish. 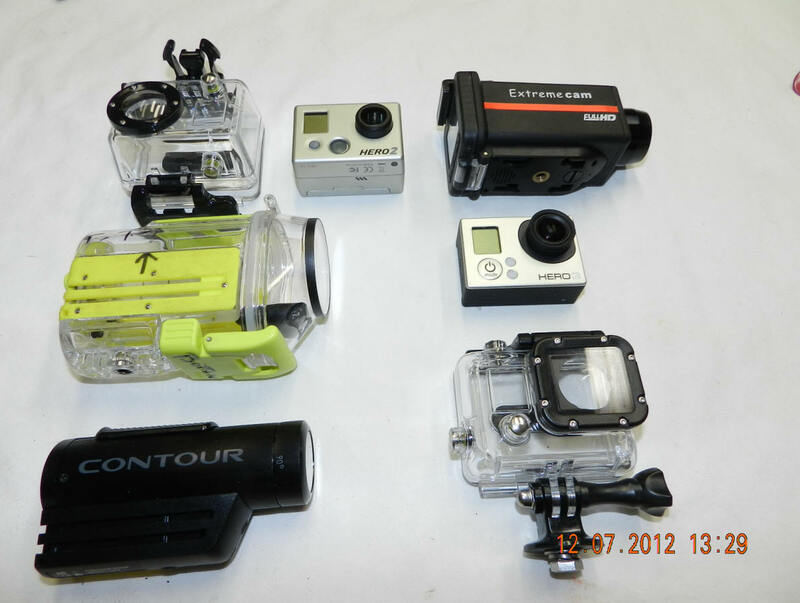 Action cameras such as GoPro and Contour are multi purpose and not just for making underwater video. It's a waste not to use action cams topside and record your entire fishing trip. 15 minutes at 1080i is about 1 gig, so a 32 gig micro SD card is capable of recording 8 hours in a stretch depending on battery life, or how often you feel like swapping in fresh batteries. 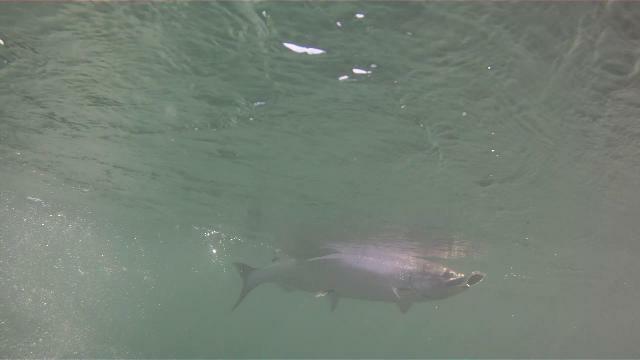 My deal with underwater filming is not to go, "oh, goodie, look at that fish hit the tackle I make!!" Then, use it as strictly a promotional tool to hawk tackle. To me? ...these little action cams just might help explain part of the mystery once we send stuff down-below. Opening up the formerly hidden abyss with even the slightest bit of knowledge is a long-long ways from where we are now. Essentially, we're groping along blindfolded, trapped by trial and error that just wastes huge sections of time. With high price of fuel nowadays turning our time on the water into an exercise in futility is something none of us can afford!